In many cases, U.S. public companies receive a high level of support from shareholders for their annual advisory vote on the executive compensation program. Based on these results, companies often conclude there is no need to make any material changes to the design of their executive compensation program. As a result, companies may not conduct an in-depth review of the design of their short- and longterm incentive programs on a regular basis. Unless there is a transformational change underway at the company, significant change in the composition of the compensation committee or senior management, or there are concerns about the current programs, the board may not see the point of the exercise. However, even in the absence of such events, it is advisable for companies to periodically examine the design of their short- and long-term incentive programs to confirm that they continue to support the business strategy, achieve appropriate alignment of pay and performance, and result in sensible pay outcomes. 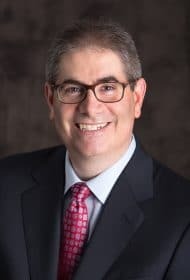 Such reviews are of added significance when one considers that variable pay typically represents the majority of executive compensation opportunity. The compensation committee should consider conducting a review of market data on program design. Doing so would inform committee members about competitive practices and how the design of the current incentive compensation programs compares to others in the market. Where variances exist between the company’s approach and majority market practice, the committee should be comfortable with discussing the reasons for such variances. For the long-term incentive program, directors should consider whether the mix of awards granted (e.g., stock options, restricted stock units and/or performance shares) remains aligned with business objectives and the company’s current situation. For example, does the current mix of awards place the proper emphasis on pay for performance, enhance the alignment of executives’ interests with those of shareholders, and foster retention? Vesting periods and, if applicable, performance measures and performance periods should also be evaluated to confirm they remain aligned with the committee’s objectives. A periodic examination of the termination provisions (e.g., treatment of awards upon retirement, termination without cause, change-in-control, etc.) is also a good practice in order to confirm the existing provisions are both appropriate and consistent among the company’s various agreements and plans. Alignment of executive pay and performance could also be an area to visit during performance evaluations. The board could consider whether realized or realizable compensation is appropriately aligned with the company’s recent financial and stock price performance. If not, such a review can help companies identify the reasons for the apparent misalignment and approaches for enhancing the alignment of pay and performance. How often should this review occur? Ideally, a comprehensive review of incentive compensation programs would be added to the compensation committee’s meeting calendar every two to three years, even in the absence of an exogenous event, including low support levels for say on pay. This approach enables the compensation committee to evaluate whether some adjustments might be needed. 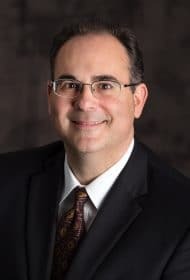 Typically, such reviews are conducted outside of the compensation busy season—in the summer or fall for calendar-year companies—when both management and the committee have the bandwidth to undertake such an assessment. 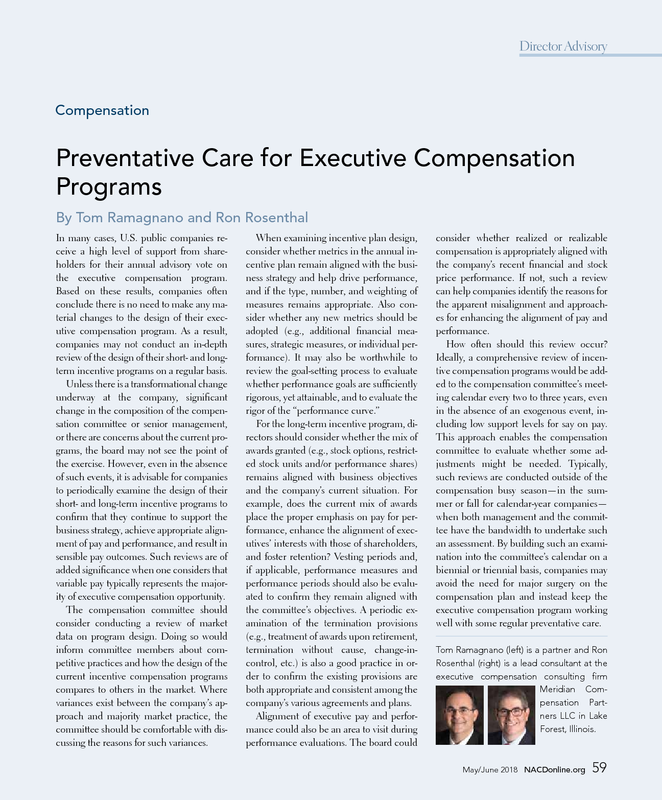 By building such an examination into the committee’s calendar on a biennial or triennial basis, companies may avoid the need for major surgery on the compensation plan and instead keep the executive compensation program working well with some regular preventative care.